Jordan Peele, Lupita Nyong'o, Tim Heidecker, Shahadi Wright Joseph, and producer Jason Blum talk about some real-life fears, why 'Us' is NOT a sequel to 'Get Out', and why 'Us' is a horror film unlike any other! Watch yourself! 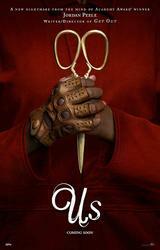 There's a new Jordan Peele horror movie hitting theaters this weekend, and... it's 'Us'! Jordan Peele joins Fandango correspondent Naz Perez to discuss the deeper meaning in the themes of his movies, share new ideas he would like to tackle, and reveals the cameos he made in his movies, 'Get Out' and 'Us'! Winston Duke and Lupita Nyong'o describe their chemistry as actors and characters on set and compare the directing styles of Jordan Peele and 'Black Panther' director Ryan Coogler in this exclusive interview for the upcoming horror film, 'Us'! Looking for movie tickets? Enter your location to see which movie theaters are playing Us (2019) near you.